When it comes to car maintenance, regularly changing your oil is perhaps one of the most important things that you can do. Unfortunately not properly changing your oil at regular intervals is one of the top mistakes new drivers make. How often you need to change the oil depends on how much you drive your car, but on average, every three months or 3,000 miles is a good goal to aim for. There are plenty of mechanics that will change your oil for you, but you can save a great deal of money if you do it yourself. However, be warned that changing your own oil can be a very messy task, so it’s a good idea to wear clothes that you don’t mind getting dirty. Look at your owner’s manual to figure out what type of oil and filter you need. Most cars need four quarts of oil. You will also need a good oil-filter wrench, a socket wrench, an oil pan, a funnel, work clothes, shop rags and possibly a jack to lift your car. Before you can add new oil, you need to drain the dirty oil from your system. To do this, reach beneath your car and look for the drain plug at the bottom of the oil pan. If you can’t get to it by reaching, you will probably need a car jack to lift your car up into the air. Place a large plastic container directly beneath the plug and slowly screw it loose. Once you get it off, the oil will flow quickly, so watch out or your hands might get drenched. 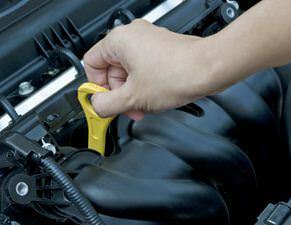 You may need a special wrench to unscrew your oil filter, or you may be able to accomplish it by hand. Either way, you will want to turn it counterclockwise until it comes loose. The filter will have oil inside of it, so be careful that it doesn’t spill all over your engine during removal. Go ahead and dump the oil in the pan with the rest of your dirty oil and wrap the filter in newspaper or a plastic bag to recycle later. Open the new bottle of oil and use a bit to lubricate the gasket on the new filter before screwing it into place. Your new filter should have specific directions regarding installation listed on the box it came in. When you’re sure that all the oil is done draining, clean the area around the plug and use a wrench to screw it back on. You will want to double check that you put it on correctly as leaking oil while driving could potentially mean doom for your car. Once you have it on, use a funnel to pour the new oil into the engine. Go slowly to prevent overflowing your funnel, and give it a few minutes to work its way down into the engine before checking your dipstick to see if it’s at the right level. After that, take your car for a spin around the neighborhood. If you check the level again a short while later and it remains full, you are good to go. When you complete these steps, you have officially changed your own oil. Your final task is to take the used oil and filter to an auto store or recycling center. Never throw them away as this is very bad for the environment.